A significant chunk of the Television & Fashion industry and some big names from the film arena were seen at the launch / birthday celebrations. The evening saw the presence of – Rohit Verma, Ayub Khan, Rahul Mahajan, Kashmira Shah, Anita Hassanandani, Ravi Behl, Sambhavna Seth, Rohit Verma, Delnaaz Irani, Vindu Dara Singh, Longinus Fernandes, Avinash & Natasha Wadhwan, Ashiesh Roy, Akruti Nagpal, Krishna Abhishekh, Mink Brar, Misti Mukherjee, Raj Suri, Siddharth Ray, Tanaz and Bhaktiyaar Irani, . Want to pursue an acting career? Well here is the way to your dreams. “DIA”- Deepshikha Institute Of Acting” promises to give the right directions to your dreams. Deepshikha Nagpal who till date has churned out ace films, TV shows and Theatre, will now open new avenue’s for acting aspirants by spreading knowledge through her very own acting academy. 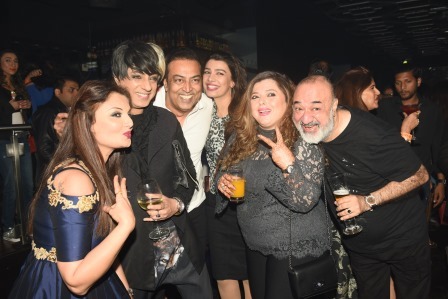 Besides the launch, Deepshikha Nagpal along with her family & friends celebrated her husband Kaishav Arora’s birthday. It was a flamboyantly splendid party with glitz, glamour, opulence and loads of love for Deepshikha & Kaishav reflecting from the entire preparations.